Welcome home! In this gated community, residents have access to a pier on Lake Davenport, the clubhouse, swimming pool, and tennis court. Youll be minutes away from Southern Dunes Golf Course, Mannys Chophouse, Walmart, Winn Dixie, Hwy 27, 17 92, I4, Haines City, Lake Eva Community Park, and just 30 minute drive away from Disney World and the theme parks. 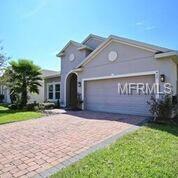 This beautiful 4 bed/2 bath home features landscaping, pavers, a two car garage, a screened lanai and a big backyard. Inside youll find neutral colors, modern finishes, spotless tile floors and natural light. The gourmet kitchen presents stainless steel appliances, a double drawer Samsung fridge, a center island with bar top seating, granite countertops, modern backsplash, pantry space and an eat in area that leads out to the covered lanai. Youll love barbecuing and entertaining out on the lanai with friends and family! The master suite has a view of the large backyard, a walk in closet, giant glass door shower with a bench, and dual vanities with granite countertops. The indoor laundry room houses cabinet storage and a Samsung washer and dryer. This well maintained home in a gated community is ready and waiting on youcall to schedule a showing and make it your own today! Listing provided courtesy of A2z Realty Group.